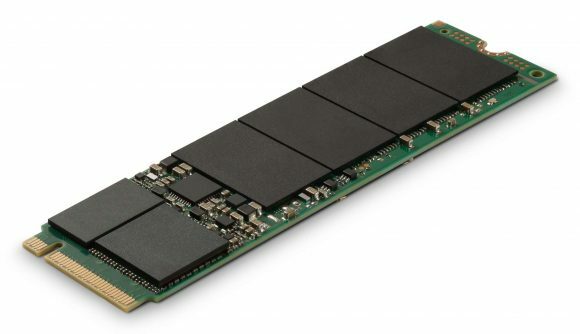 Micron has revealed its first ever SSD running a homebrew memory controller. That’s big news in the solid state world – being able to build SSDs from its own memory and memory controller is what put Samsung at the top of the tech tree, and now Micron has finally stepped up to the plate too. The Micron 2200 SSD is a relatively entry-level NVMe SSD, without the straight line storage performance or endurance to worry the big boys, and it’s most likely going to be released as an OEM drive for installation in enterprise PCs and laptops. But we would be very surprised if it didn’t see some consumer-facing rebadging under the company’s Crucial branding soon. Right now we don’t have any real details about the actual controller itself; Micron hasn’t released any specifications about it at all. So we don’t know what production node it’s built on or how many cores it’s rocking, but we do have the basic specs sheet for the Micron 2200 SSD itself, and it’s not a bad start. So long as it’s an affordable option, anyway. The Micron 2200 SSD comes in three distinct flavours: a 256GB, 512GB, and a 1TB drive. They’re all sporting that same in-house Micron controller, and all run across a PCIe 3.0 interface at x4 speeds, using the NVMe protocol. They are, of course, all using Micron’s own NAND flash memory, of the 64-layer 3D TLC type. In terms of the actual performance we’re looking at asymmetrical read/write speeds, with all three drives reportedly capable of hitting up to 3,000MB/s and 1,600MB/s respectively in terms of sequential performance. That puts the Micron 2200 in the same bracket as the first Western Digital Black NVMe drive and the slowest, 250GB version of Samsung’s 970 EVO. The latest WD Black SN750 drive, however, has matched up its read/write performance and higher capacity 970 EVO drives offer superior write speeds too. It’s also worth pointing to the endurance of the new Micron drives – with the 1TB version delivering a warrantied endurance rating of just 300TB that’s half the guaranteed lifespan of either the WD Black or Samsung 970 EVO of the same capacity. But this is a first step on the controller ladder for Micron after its acquisition of Tidal Systems a few years back, and a vital one for the company as it seeks to cement its place at the top table of solid state drive manufacturers. Western Digital has been making hugely positive strides since it started building drives using its own SanDisk memory and its own controllers. The latest WD Black SN750 is a fantastic NVMe SSD and the company has recently announced the first mainstream WD Blue SN500 too; an affordable NVMe drive running across a PCIe 3.0 x2 interface. We’ll have a review of WD’s new budget drive very soon. Using a mix of its own memory and controllers is largely why Samsung has been able to dominate the market for so long. It was the first to see the benefit of investing in its own controller and is now the biggest name in consumer SSDs because of it. And with WD and Micron now both following suit we could be looking at the final consolidation of the SSD market. Fingers crossed we see a retail version of Micron’s new SSD under the Crucial name soon so we can get a handle on how it performs in our gaming rigs.